An angel girl who came to the Netherworld to become the Overlord. She claims to be Krichevskoy's daughter and Laharl's sister but now one believes her. She has a very tight hard-working personality. However, she can be off sometimes, like sending herself to the netherworld in a package. Her reasoning for that as so she won't get lost. She's good at cooking, and likes making sweets. 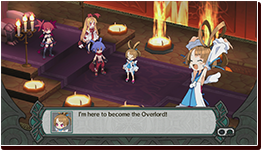 A package sent to the Netherworld for The "overlord" When Laharl tries to open it, it starts shining and out came an angel girl with small white wings. Who the hell are you!? I'm Sicily, I'm here to become the Overlord! An unexpected package and an even more unexpected statement. To further make this situation unexpected she then proceeds to say... Let me become overlord, "Big Brother". 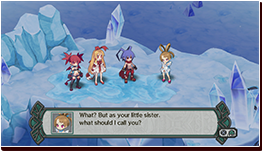 Due to the arrival of Laharl's self-proclaimed lettle sister, chaos commences.